Kalamariá (Greek: Καλαμαριά, Good Side or Port Side) is a municipality (Borough) of the Thessaloniki Urban Area, located about 7 kilometres (4 miles) southeast of downtown Thessaloniki. It is the second largest municipality (with a population of 91,279 as of 2011[update]) of the Thessaloniki Urban Area as well as one of the largest in Greece, with a population increase of 13% since the 1991 census. The area was first settled by humans in prehistoric times, and remains from that settlement have been found around the Karabournaki cape. The name Kalamaria was first used in 1083 to denote the area southeast of Thessaloniki, including but not limited to the area of the present-day municipality. During the Byzantine and the Ottoman periods, the area was mostly uninhabited, except for a few fishing lodges. 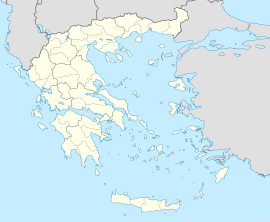 The first settlement was created in the early 1920s to house refugees from the Greek diaspora in Georgia and Asia Minor, who fled or were forcibly sent to Greece as a result of the Greco-Turkish War. As many as 100,000 refugees relocated to Thessaloniki, primarily to the city's suburbs. Refugees of Pontic descent mainly relocated in Kalamaria. In 1931, an antisemitic riot, led by National Union of Greece, took place in Camp Campbell, located in nowadays Kalamaria, where a Jewish neighborhood was completely burned, leaving 500 families homeless and one Jewish resident dead. Kalamaria has seen substantial recent growth as part of a population shift from rural and urban areas to suburban areas, particularly to those east of Thessaloniki. Between the 1981 and 2001 censuses, the population of Kalamaria grew by about 36,000 (or 69%). Up until 1943 Kalamaria was part of the Municipality of Thessaloniki. On 1 January 1943 it became an independent administrative unit. Kalamaria had a population of 14,000 residents as recorded by an inventory in 1947, but this has considerably increased, as shown by the Greek census of 2001 where Kalamaria had a total of 87,255 residents. Kalamaria has the second highest population in the Council of the Town Planning Group of Thessaloniki but also of Northern Greece and ninth in all of Greece. Though it was originally separated from the main City of Thessaloniki, the municipality has grown so much in the post-war period that the older physical boundaries are virtually non-existent. Nowadays, the border between the two municipalities exists purely for administrative purposes. The total area of the Municipality of Kalamaria covers 6.401 square kilometres (2.47 square miles). About two thirds of the perimeter are 6.5 kilometres (4.0 miles) of coastline. The municipality is separated into 10 geographical districts, which have been given names reminiscent of the refugees' former homelands. Kalamaria has 14 sporting teams including the famous Apollon Kalamarias. The main roads that feed into the municipality are those of Konstantinos Karamanlis Avenue (formerly Nea Egnatia) to the east (which links with the A25 (the Thessaloniki-Chalkidiki motorway)), Taki Ekonomidi Avenue (which links the popular district of Nea Krini with Thessaloniki's city center), Megalou Alexandrou Avenue - the biggest avenue in Thessaloniki and the EO16 which provides the main access from Kalamaria to the airport and the outer south-eastern suburbs of Thessaloniki. Other main road links exist with Thermi, while the southeast end of the Thessaloniki ring road (which bypasses the Thessaloniki Urban Area) lies to the southeast of Kalamaria. The first Mobility Centre in Greece started functioning in Kalamaria (June 2008). The notable music composer, Stavros Kouyioumtzis (1932–2005), was a resident of Kalamaria during the last years of his life. He was buried at Kalamaria's municipal cemetery. One of the most famous natives of Kalamaria is the popular actor and comedian Harry Klynn (originally Vassilis Triantafylides) (born 1940). Klynn was candidate for Mayor of Kalamaria at the local elections of 2006. ^ "Ιστορία" [History] (in Greek). Municipality of Kalamaria. Retrieved 18 August 2018. ^ "Networks, town twinning and partnerships" (PDF). City of Solna. Retrieved 2013-08-04. Wikimedia Commons has media related to Kalamaria.